Greenville freshman Warren Hartzell picks up win in season opener against Milton-Union. 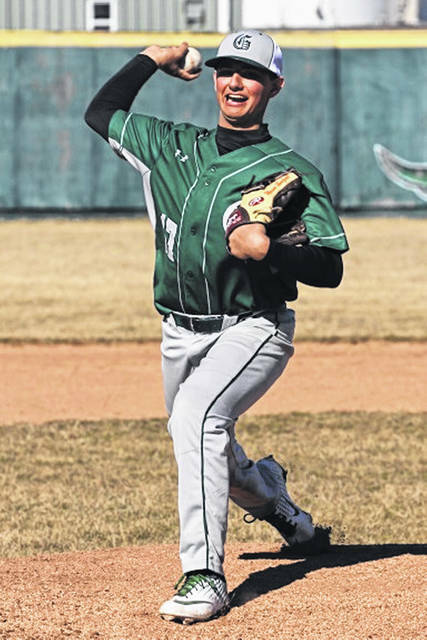 GREENVILLE – The Green Wave opened the 2019 varsity baseball season with a 3-2 non-conference win over the visiting Milton-Union Bulldogs in a Saturday noon match-up with two freshmen, Warren Hartzell and Alex Kolb doing the pitching on the mound. The visitors got on the board first plating a run in the top of the second to lead 1-0 after two complete. Landon Eldridge took first with one out in the bottom of the third by a hits batman, stole second and went to third by way of a passed ball setting up a Tyler Beyke RBI single to right knotting the score 1-1 with three innings in the book. Hartzell opened the bottom of the fourth with a double to left, advanced to third by way of a Bulldogs balk and scored on a sacrifice fly to right off the bat of Reed Hanes to give Greenville its first lead of the day with the teams heading to the fifth-inning with the Wave holding a 2-1 lead. Milton-Union battle back scoring a run in the top of the sixth to even the score at 2-2 with Greenville coming to bat in the bottom of the inning. The Wave answered with a run in the bottom of the sixth with Hanes taking advantage of a hits batman to reach first and scored on a two out Kole Francis line drive single to center giving Greenville a 3-2 lead that would hold up for the final score. Hartzell picked up the win for Greenville tossing five innings, allowing four hits and one run while striking out seven. Alex Kolb threw two innings in relief surrendering one hit, striking out four while recording six outs to earn the save. Greenville knocked out seven hits with Beyke going 3-3 at the plate and a RBI, Francis went 2-3 with an RBI and Tytan Grote and Hartzell each collecting a hit. Hanes accounted for a RBI. The Wave struggle in game two of the twin bill falling to the Bulldogs 13-3.
https://www.dailyadvocate.com/wp-content/uploads/sites/34/2019/03/web1_GB-Warren-Hartzell-8-inches.jpgGreenville freshman Warren Hartzell picks up win in season opener against Milton-Union.